Hydrophobic treatment is used to protect porous surfaces from moisture penetration, so that adhesion of dirt, algae and moss growth is reduced. It also reduces / prevents hydrophobic surface frost damage, salt and lime efflorescence. The surface will always remain vapour-permeable! 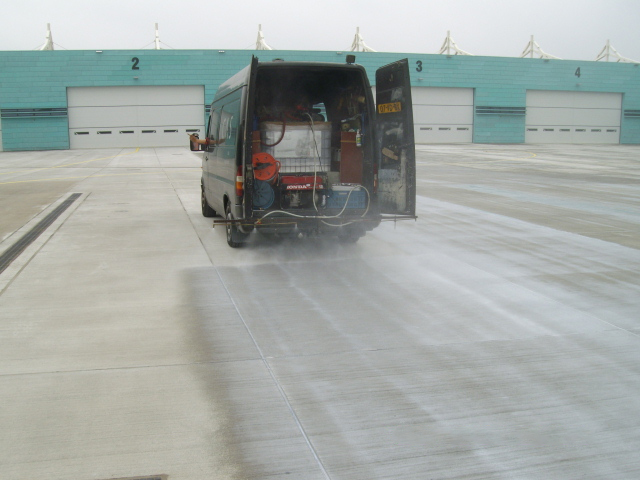 An impregnation of a hydrophobic agent is applied to porous surfaces such as masonry, concrete, natural stone and other mineral surfaces in both horizontal (infrastructure) and vertical (walls and structures) surfaces. Products applied to bridges and overpasses (usually) have an approval report, in accordance with BSW 93-26 or BSW 96-21, standards of the Construction Division of the Department of Waterways and Public Works, and/or Directive RTD 1002, including additional requirements of NEN-EN 1504-2 and TNO. Depending on the surface to be treated and the application, a choice is made from the different types. The durability of an impregnation is generally 10 years. When you use impregnation to keep the surface clean, the treatment will have to be repeated after a number of years.